Computing is any activity that uses computers. It includes developing hardware and software, and using computers to manage, process, and communicate information for various purposes. Computing is a critically important, integral component of modern industrial technology. Major computing disciplines include computer engineering, software engineering, computer science, information systems, and information technology. In a general way, we can define computing to mean any goal-oriented activity requiring, benefiting from, or creating computers. Thus, computing includes designing and building hardware and software systems for a wide range of purposes; processing, structuring, and managing various kinds of information; doing scientific studies using computers; making computer systems behave intelligently; creating and using communications and entertainment media; finding and gathering information relevant to any particular purpose, and so on. The list is virtually endless, and the possibilities are vast. and it defines five sub-disciplines of the computing field: computer science, computer engineering, information systems, information technology, and software engineering. Computing also has other meanings that are more specific, based on the context in which the term is used. For example, an information systems specialist will view computing somewhat differently from a software engineer. Regardless of the context, doing computing well can be complicated and difficult. Because society needs people to do computing well, we must think of computing not only as a profession but also as a discipline. The discipline of computing is the systematic study of algorithmic processes that describe and transform information: their theory, analysis, design, efficiency, implementation, and application. The fundamental question underlying all computing is "What can be (efficiently) automated?" The term "computing" is also synonymous with counting and calculating. In earlier times, it was used in reference to the action performed by mechanical computing machines, and before that, to human computers. The history of computing is longer than the history of computing hardware and modern computing technology and includes the history of methods intended for pen and paper or for chalk and slate, with or without the aid of tables. Computing is intimately tied to the representation of numbers. But long before abstractions like the number arose, there were mathematical concepts to serve the purposes of civilization. These concepts include one-to-one correspondence (the basis of counting), comparison to a standard (used for measurement), and the 3-4-5 right triangle (a device for assuring a right angle). The earliest known tool for use in computation was the abacus, and it was thought to have been invented in Babylon circa 2400 BC. Its original style of usage was by lines drawn in sand with pebbles. Abaci, of a more modern design, are still used as calculation tools today. This was the first known calculation aid - preceding Greek methods by 2,000 years. The first recorded idea of using digital electronics for computing was the 1931 paper "The Use of Thyratrons for High Speed Automatic Counting of Physical Phenomena" by C. E. Wynn-Williams. Claude Shannon's 1938 paper "A Symbolic Analysis of Relay and Switching Circuits" then introduced the idea of using electronics for Boolean algebraic operations. A computer is a machine that manipulates data according to a set of instructions called a computer program. The program has an executable form that the computer can use directly to execute the instructions. The same program in its human-readable source code form, enables a programmer to study and develop a sequence of steps known as an algorithm. Because the instructions can be carried out in different types of computers, a single set of source instructions converts to machine instructions according to the central processing unit type. The execution process carries out the instructions in a computer program. Instructions express the computations performed by the computer. They trigger sequences of simple actions on the executing machine. Those actions produce effects according to the semantics of the instructions. Computer software or just "software", is a collection of computer programs and related data that provides the instructions for telling a computer what to do and how to do it. Software refers to one or more computer programs and data held in the storage of the computer for some purposes. In other words, software is a set of programs, procedures, algorithms and its documentation concerned with the operation of a data processing system. Program software performs the function of the program it implements, either by directly providing instructions to the computer hardware or by serving as input to another piece of software. The term was coined to contrast with the old term hardware (meaning physical devices). In contrast to hardware, software is intangible. Software is also sometimes used in a more narrow sense, meaning application software only. Application software, also known as an "application" or an "app", is a computer software designed to help the user to perform specific tasks. Examples include enterprise software, accounting software, office suites, graphics software and media players. Many application programs deal principally with documents. Apps may be bundled with the computer and its system software, or may be published separately. Some users are satisfied with the bundled apps and need never install one. Application software is contrasted with system software and middleware, which manage and integrate a computer's capabilities, but typically do not directly apply them in the performance of tasks that benefit the user. The system software serves the application, which in turn serves the user. Application software applies the power of a particular computing platform or system software to a particular purpose. Some apps such as Microsoft Office are available in versions for several different platforms; others have narrower requirements and are thus called, for example, a Geography application for Windows or an Android application for education or Linux gaming. Sometimes a new and popular application arises that only runs on one platform, increasing the desirability of that platform. This is called a killer application. System software, or systems software, is computer software designed to operate and control the computer hardware and to provide a platform for running application software. System software includes operating systems, utility software, device drivers, window systems, and firmware. Frequently development tools such as compilers, linkers, and debuggers are classified as system software. A computer network, often simply referred to as a network, is a collection of hardware components and computers interconnected by communication channels that allow sharing of resources and information. Where at least one process in one device is able to send/receive data to/from at least one process residing in a remote device, then the two devices are said to be in a network. Networks may be classified according to a wide variety of characteristics such as the medium used to transport the data, communications protocol used, scale, topology, and organizational scope. Communications protocols define the rules and data formats for exchanging information in a computer network, and provide the basis for network programming. Well-known communications protocols are Ethernet, a hardware and Link Layer standard that is ubiquitous in local area networks, and the Internet Protocol Suite, which defines a set of protocols for internetworking, i.e. for data communication between multiple networks, as well as host-to-host data transfer, and application-specific data transmission formats. Computer networking is sometimes considered a sub-discipline of electrical engineering, telecommunications, computer science, information technology or computer engineering, since it relies upon the theoretical and practical application of these disciplines. The Internet is a global system of interconnected computer networks that use the standard Internet protocol suite (TCP/IP) to serve billions of users that consists of millions of private, public, academic, business, and government networks, of local to global scope, that are linked by a broad array of electronic, wireless and optical networking technologies. The Internet carries an extensive range of information resources and services, such as the inter-linked hypertext documents of the World Wide Web (WWW) and the infrastructure to support email. Computer programming in general is the process of writing, testing, debugging, and maintaining the source code and documentation of computer programs. This source code is written in a programming language, which is an artificial language often more restrictive or demanding than natural languages, but easily translated by the computer. The purpose of programming is to invoke the desired behavior (customization) from the machine. The process of writing high quality source code requires knowledge of both the application's domain and the computer science domain. The highest-quality software is thus developed by a team of various domain experts, each person a specialist in some area of development. But the term programmer may apply to a range of program quality, from hacker to open source contributor to professional. And a single programmer could do most or all of the computer programming needed to generate the proof of concept to launch a new "killer" application. A programmer, computer programmer, or coder is a person who writes computer software. The term computer programmer can refer to a specialist in one area of computer programming or to a generalist who writes code for many kinds of software. One who practices or professes a formal approach to programming may also be known as a programmer analyst. A programmer's primary computer language (C, C++, Java, Lisp, Python, etc.) is often prefixed to the above titles, and those who work in a web environment often prefix their titles with web. The term programmer can be used to refer to a software developer, software engineer, computer scientist, or software analyst. However, members of these professions typically possess other software engineering skills, beyond programming. The computer industry is made up of all of the businesses involved in developing computer software, designing computer hardware and computer networking infrastructures, the manufacture of computer components and the provision of information technology services including system administration and maintenance. The software industry includes businesses engaged in development, maintenance and publication of software. The industry also includes software services, such as training, documentation, and consulting. Computer engineering is a discipline that integrates several fields of electrical engineering and computer science required to develop computer hardware and software. Computer engineers usually have training in electronic engineering (or electrical engineering), software design, and hardware-software integration instead of only software engineering or electronic engineering. Computer engineers are involved in many hardware and software aspects of computing, from the design of individual microprocessors, personal computers, and supercomputers, to circuit design. This field of engineering not only focuses on how computer systems themselves work, but also how they integrate into the larger picture. Software engineering (SE) is the application of a systematic, disciplined, quantifiable approach to the design, development, operation, and maintenance of software, and the study of these approaches; that is, the application of engineering to software. In layman's terms, it is the act of using insights to conceive, model and scale a solution to a problem. The first reference to the term is the 1968 NATO Software Engineering Conference and was meant to provoke thought regarding the perceived "software crisis" at the time. Software development, a much used and more generic term, does not necessarily subsume the engineering paradigm. The generally accepted concepts of Software Engineering as an engineering discipline have been specified in the Guide to the Software Engineering Body of Knowledge (SWEBOK). The SWEBOK has become an internationally accepted standard ISO/IEC TR 19759:2005. Computer science or computing science (abbreviated CS or Comp Sci) is the scientific and practical approach to computation and its applications. A computer scientist specializes in the theory of computation and the design of computational systems. Its subfields can be divided into practical techniques for its implementation and application in computer systems and purely theoretical areas. Some, such as computational complexity theory, which studies fundamental properties of computational problems, are highly abstract, while others, such as computer graphics, emphasize real-world applications. Still others focus on the challenges in implementing computations. For example, programming language theory studies approaches to description of computations, while the study of computer programming itself investigates various aspects of the use of programming languages and complex systems, and human–computer interaction focuses on the challenges in making computers and computations useful, usable, and universally accessible to humans. "A majority of IS [degree] programs are located in business schools; however, they may have different names such as management information systems, computer information systems, or business information systems. All IS degrees combine business and computing topics, but the emphasis between technical and organizational issues varies among programs. For example, programs differ substantially in the amount of programming required." The study bridges business and computer science using the theoretical foundations of information and computation to study various business models and related algorithmic processes within a computer science discipline. This field studies computers and algorithmic processes, including their principles, their software and hardware designs, their applications, and their impact on society while IS emphasizes functionality over design. A system administrator, IT systems administrator, systems administrator, or sysadmin is a person employed to maintain and operate a computer system or network. The duties of a system administrator are wide-ranging, and may vary substantially from one organization to another. Sysadmins are usually charged with installing, supporting and maintaining servers or other computer systems, and planning for and responding to service outages and other problems. Other duties may include scripting or light programming, project management for systems-related projects, supervising or training computer operators, and being the consultant for computer problems beyond the knowledge of technical support staff. DNA-based computing and quantum computing are areas of active research in both hardware and software (such as the development of quantum algorithms). Potential infrastructure for future technologies includes DNA origami on photolithography and quantum antennae for transferring information between ion traps. By 2011, researchers had entangled 14 qubits. Fast digital circuits (including those based on Josephson junctions and rapid single flux quantum technology) are becoming more nearly realizable with the discovery of nanoscale superconductors. Fiber-optic and photonic (optical) devices, which already have been used to transport data over long distances, have started being used by data centers, side by side with CPU and semiconductor memory components. This allows the separation of RAM from CPU by optical interconnects. IBM has created an integrated circuit with both electronic and optical information processing in one chip. This is denoted "CMOS-integrated nanophotonics" or (CINP). One benefit of optical interconnects is that motherboards which formerly required a certain kind of system on a chip (SoC) can now move formerly dedicated memory and network controllers off the motherboards, spreading the controllers out onto the rack. This allows standardization of backplane interconnects and motherboards for multiple types of SoCs, which allows more timely upgrades of CPUs. ^ a b The Joint Task Force for Computing Curricula 2005. "Computing Curricula 2005: The Overview Report" (PDF). Archived from the original (pdf) on 2014-10-21. ^ "Curricula Recommendations". Association for Computing Machinery. 2005. Retrieved 2012-11-30. ^ Peter J. Denning; et al. (January 1989). "Computing as a Discipline" (PDF). Communications of the ACM. Association for Computing Machinery. 32: 9–23. doi:10.1145/63238.63239. Archived from the original (PDF) on 2010-10-06. Retrieved 2012-11-30. ^ "The History of Computing". mason.gmu.edu. Retrieved 2019-04-12. ^ "Wordreference.com: WordNet 2.0". Princeton University, Princeton, NJ. Retrieved 2007-08-19. ^ "Computer network definition". Archived from the original on 2012-01-21. Retrieved 2011-11-12. ^ IEEE Computer Society; ACM (12 December 2004). Computer Engineering 2004: Curriculum Guidelines for Undergraduate Degree Programs in Computer Engineering (pdf). p. iii. Retrieved 2012-12-17. Computer System engineering has traditionally been viewed as a combination ofboth electronic engineering (EE) and computer science (CS). ^ Trinity College Dublin. "What is Computer System Engineering". Retrieved 2006-04-21. , "Computer engineers need not only to understand how computer systems themselves work, but also how they integrate into the larger picture. Consider the car. A modern car contains many separate computer systems for controlling such things as the engine timing, the brakes and the air bags. To be able to design and implement such a car, the computer engineer needs a broad theoretical understanding of all these various subsystems & how they interact. ^ ACM (2006). "Computing Degrees & Careers". ACM. Retrieved 2010-11-23. ^ Laplante, Phillip (2007). What Every Engineer Should Know about Software Engineering. Boca Raton: CRC. ISBN 978-0-8493-7228-5. Retrieved 2011-01-21. ^ Peter, Naur; Randell, Brian (7–11 October 1968). Software Engineering: Report of a conference sponsored by the NATO Science Committee (PDF). Garmisch, Germany: Scientific Affairs Division, NATO. Retrieved 2008-12-26. ^ Randell, Brian (10 August 2001). "The 1968/69 NATO Software Engineering Reports". Brian Randell's University Homepage. The School of the Computer Sciences, Newcastle University. Retrieved 2008-10-11. The idea for the first NATO Software Engineering Conference, and in particular that of adopting the then practically unknown term "software engineering" as its (deliberately provocative) title, I believe came originally from Professor Fritz Bauer. ^ "ISO/IEC TR 19759:2005". Retrieved 2012-04-01. ^ "WordNet Search - 3.1". Wordnetweb.princeton.edu. Retrieved 2012-05-14. ^ "Definition of Application Landscape". Software Engineering for Business Information Systems (sebis). Jan 21, 2009. Archived from the original on March 5, 2011. Retrieved January 14, 2011. ^ Jessup, Leonard M.; Valacich, Joseph S. (2008). Information Systems Today (3rd ed.). Pearson Publishing. pp. ?? ?, 416. ^ "Computing Degrees & Careers " Information Systems". Association for Computing Machinery. Retrieved 6 July 2018. ^ Denning, Peter (June 2007). "Ubiquity a new interview with Peter Denning on the great principles of computing". 2007 (June): 1–1. People from other fields are saying they have discovered information processes in their deepest structures and that collaboration with computing is essential to them. ^ "Computer science is the study of information". New Jersey Institute of Technology: Gutenberg Information Technologies. Archived from the original on May 29, 2009. ^ Computer Science Department, College of Saint Benedict. "Computer science is the study of computation". Saint John's University. ^ "Computer Science is the study of all aspects of computer systems, from the theoretical foundations to the very practical aspects of managing large software projects". Massey University. Archived from the original on 2006-06-19. ^ Kelly, Sue; Gibson, Nicola; Holland, Christopher; Light, Ben (July 1999). "Focus Issue on Legacy Information Systems and Business Process Engineering: a Business Perspective of Legacy Information Systems". Communications of the AIS. 2 (7): 1–27. ^ Pearson Custom Publishing & West Chester University (2009). Custom Program for Computer Information Systems (CSC 110). Pearson Custom Publishing. p. 694. ^ Polack, Jennifer (December 2009). "Planning a CIS Education Within a CS Framework". Journal of Computing Sciences in Colleges. 25 (2): 100–106. ISSN 1937-4771. ^ CSTA Committee; Allen Tucker; et al. (2006). A Model Curriculum for K-12 Computer Science (Final Report). Association for Computing Machinery, Inc. pp. 0, 2. ^ Freeman, Peter; Hart, David (August 2004). "A Science of Design for Software-Intensive Systems". Communications of the ACM. 47 (8): 19–21. doi:10.1145/1012037.1012054. ISSN 0001-0782. Computer science and engineering needs an intellectually rigorous, analytical, teachable design process to ensure development of systems we all can live with ... Though the other components' connections to the software and their role in the overall design of the system are critical, the core consideration for a software-intensive system is the software itself, and other approaches to systematizing design have yet to solve the "software problem"—which won't be solved until software design is understood scientifically. ^ "Free on-line dictionary of computing (FOLDOC)". Retrieved 9 Feb 2013. ^ On the later more broad application of the term IT, Keary comments- "In its original application 'information technology' was appropriate to describe the convergence of technologies with application in the broad field of data storage, retrieval, processing, and dissemination. This useful conceptual term has since been converted to what purports to be concrete use, but without the reinforcement of definition...the term IT lacks substance when applied to the name of any function, discipline, or position." Anthony Ralston (2000). Encyclopedia of computer science. Nature Pub. Group. ISBN 978-1-56159-248-7. Retrieved 12 May 2013. .
^ "World record: Calculations with 14 quantum bits". Application software (app for short) is software designed to perform a group of coordinated functions, tasks, or activities for the benefit of the user. Examples of an application include a word processor, a spreadsheet, an accounting application, a web browser, an email client,a media player, a file viewer, an aeronautical flight simulator, a console game or a photo editor. The collective noun application software refers to all applications collectively. This contrasts with system software, which is mainly involved with running the computer. Applications may be bundled with the computer and its system software or published separately, and may be coded as proprietary, open-source or university projects. Apps built for mobile platforms are called mobile apps. Client–server model is a distributed application structure that partitions tasks or workloads between the providers of a resource or service, called servers, and service requesters, called clients. 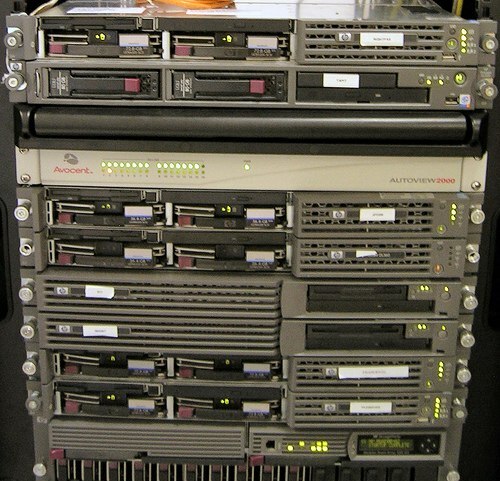 Often clients and servers communicate over a computer network on separate hardware, but both client and server may reside in the same system. A server host runs one or more server programs which share their resources with clients. A client does not share any of its resources, but requests a server's content or service function. Clients therefore initiate communication sessions with servers which await incoming requests. Examples of computer applications that use the client–server model are Email, network printing, and the World Wide Web. Advocates of public and hybrid clouds note that cloud computing allows companies to avoid or minimize up-front IT infrastructure costs. Proponents also claim that cloud computing allows enterprises to get their applications up and running faster, with improved manageability and less maintenance, and that it enables IT teams to more rapidly adjust resources to meet fluctuating and unpredictable demand. Cloud providers typically use a "pay-as-you-go" model, which can lead to unexpected operating expenses if administrators are not familiarized with cloud-pricing models.The availability of high-capacity networks, low-cost computers and storage devices as well as the widespread adoption of hardware virtualization, service-oriented architecture, and autonomic and utility computing has led to growth in cloud computing. A computer is a machine that can be instructed to carry out sequences of arithmetic or logical operations automatically via computer programming. Modern computers have the ability to follow generalized sets of operations, called programs. These programs enable computers to perform an extremely wide range of tasks. A "complete" computer including the hardware, the operating system (main software), and peripheral equipment required and used for "full" operation can be referred to as a computer system. This term may as well be used for a group of computers that are connected and work together, in particular a computer network or computer cluster. Computers are used as control systems for a wide variety of industrial and consumer devices. This includes simple special purpose devices like microwave ovens and remote controls, factory devices such as industrial robots and computer-aided design, and also general purpose devices like personal computers and mobile devices such as smartphones. The Internet is run on computers and it connects hundreds of millions of other computers and their users. Early computers were only conceived as calculating devices. Since ancient times, simple manual devices like the abacus aided people in doing calculations. Early in the Industrial Revolution, some mechanical devices were built to automate long tedious tasks, such as guiding patterns for looms. More sophisticated electrical machines did specialized analog calculations in the early 20th century. The first digital electronic calculating machines were developed during World War II. The speed, power, and versatility of computers have been increasing dramatically ever since then. Conventionally, a modern computer consists of at least one processing element, typically a central processing unit (CPU), and some form of memory. The processing element carries out arithmetic and logical operations, and a sequencing and control unit can change the order of operations in response to stored information. Peripheral devices include input devices (keyboards, mice, joystick, etc. ), output devices (monitor screens, printers, etc. ), and input/output devices that perform both functions (e.g., the 2000s-era touchscreen). Peripheral devices allow information to be retrieved from an external source and they enable the result of operations to be saved and retrieved. Computer science is the study of processes that interact with data and that can be represented as data in the form of programs. It enables the use of algorithms to manipulate, store, and communicate digital information. A computer scientist studies the theory of computation and the practice of designing software systems.Its fields can be divided into theoretical and practical disciplines. Computational complexity theory is highly abstract, while computer graphics emphasizes real-world applications. Programming language theory considers approaches to the description of computational processes, while computer programming itself involves the use of programming languages and complex systems. Human–computer interaction considers the challenges in making computers useful, usable, and accessible. Distributed computing is a field of computer science that studies distributed systems. A distributed system is a system whose components are located on different networked computers, which communicate and coordinate their actions by passing messages to one another. The components interact with one another in order to achieve a common goal. Three significant characteristics of distributed systems are: concurrency of components, lack of a global clock, and independent failure of components. Examples of distributed systems vary from SOA-based systems to massively multiplayer online games to peer-to-peer applications. A computer program that runs within a distributed system is called a distributed program (and distributed programming is the process of writing such programs). There are many different types of implementations for the message passing mechanism, including pure HTTP, RPC-like connectors and message queues.Distributed computing also refers to the use of distributed systems to solve computational problems. In distributed computing, a problem is divided into many tasks, each of which is solved by one or more computers, which communicate with each other via message passing. The terms foobar (), or foo and others are used as placeholder names (also referred to as metasyntactic variables) in computer programming or computer-related documentation. They have been used to name entities such as variables, functions, and commands whose exact identity is unimportant and serve only to demonstrate a concept. A computer hacker is any skilled computer expert that uses their technical knowledge to overcome a problem. While "hacker" can refer to any skilled computer programmer, the term has become associated in popular culture with a "security hacker", someone who, with their technical knowledge, uses bugs or exploits to break into computer systems. A personal computer (PC) is a multi-purpose computer whose size, capabilities, and price make it feasible for individual use. Personal computers are intended to be operated directly by an end user, rather than by a computer expert or technician. Unlike large costly minicomputer and mainframes, time-sharing by many people at the same time is not used with personal computers. Institutional or corporate computer owners in the 1960s had to write their own programs to do any useful work with the machines. While personal computer users may develop their own applications, usually these systems run commercial software, free-of-charge software ("freeware") or free and open-source software, which is provided in ready-to-run form. Software for personal computers is typically developed and distributed independently from the hardware or operating system manufacturers. Many personal computer users no longer need to write their own programs to make any use of a personal computer, although end-user programming is still feasible. This contrasts with mobile systems, where software is often only available through a manufacturer-supported channel, and end-user program development may be discouraged by lack of support by the manufacturer.Since the early 1990s, Microsoft operating systems and Intel hardware have dominated much of the personal computer market, first with MS-DOS and then with Microsoft Windows. Alternatives to Microsoft's Windows operating systems occupy a minority share of the industry. These include Apple's macOS and free and open-source Unix-like operating systems such as Linux. Advanced Micro Devices (AMD) provides the main alternative to Intel's processors. The advent of personal computers and the concurrent Digital Revolution have significantly affected the lives of people in all countries. Quantum computing is the use of quantum-mechanical phenomena such as superposition and entanglement to perform computation. A quantum computer is used to perform such computation, which can be implemented theoretically or physically.The field of quantum computing is actually a sub-field of quantum information science, which includes quantum cryptography and quantum communication. Quantum Computing was started in the early 1980s when Richard Feynman and Yuri Manin expressed the idea that a quantum computer had the potential to simulate things that a classical computer could not. In 1994, Peter Shor shocked the world with an algorithm that had the potential to decrypt all secured communications.There are two main approaches to physically implementing a quantum computer currently, analog and digital. Analog approaches are further divided into quantum simulation, quantum annealing, and adiabatic quantum computation. Digital quantum computers use quantum logic gates to do computation. Both approaches use quantum bits or qubits.Qubits are fundamental to quantum computing and are somewhat analogous to bits in a classical computer. Qubits can be in a 1 or 0 quantum state. But they can also be in a superposition of the 1 and 0 states. However, when qubits are measured the result is always either a 0 or a 1; the probabilities of the two outcomes depends on the quantum state they were in. Today's physical quantum computers are very noisy and quantum error correction is a burgeoning field of research. Unfortunately existing hardware is so noisy that fault-tolerant quantum computing [is] still a rather distant dream. As of April 2019 neither large scalable quantum hardware has been demonstrated nor have commercially useful algorithms for today's small noisy quantum computers been published. There is an increasing amount of investment in quantum computing by governments, established companies, and start-ups . Both applications of near-term intermediate-scale devices and the demonstration of quantum supremacy are actively pursued in academic and industrial research. R is a programming language and free software environment for statistical computing and graphics supported by the R Foundation for Statistical Computing. The R language is widely used among statisticians and data miners for developing statistical software and data analysis. Polls, data mining surveys, and studies of scholarly literature databases show substantial increases in popularity in recent years. as of March 2019, R ranks 14th in the TIOBE index, a measure of popularity of programming languages.A GNU package, source code for the R software environment is written primarily in C, Fortran and R itself, and is freely available under the GNU General Public License. Pre-compiled binary versions are provided for various operating systems. Although R has a command line interface, there are several graphical user interfaces, such as RStudio, an integrated development environment. In computing, a server is a computer program or a device that provides functionality for other programs or devices, called "clients". This architecture is called the client–server model, and a single overall computation is distributed across multiple processes or devices. Servers can provide various functionalities, often called "services", such as sharing data or resources among multiple clients, or performing computation for a client. A single server can serve multiple clients, and a single client can use multiple servers. A client process may run on the same device or may connect over a network to a server on a different device. Typical servers are database servers, file servers, mail servers, print servers, web servers, game servers, and application servers.Client–server systems are today most frequently implemented by (and often identified with) the request–response model: a client sends a request to the server, which performs some action and sends a response back to the client, typically with a result or acknowledgement. Designating a computer as "server-class hardware" implies that it is specialized for running servers on it. This often implies that it is more powerful and reliable than standard personal computers, but alternatively, large computing clusters may be composed of many relatively simple, replaceable server components. A software developer is a person concerned with facets of the software development process, including the research, design, programming, and testing of computer software. Other job titles which are often used with similar meanings are programmer, software analyst, and software programer. In a large company, there may be employees whose sole responsibility consists of only one of the phases above. In smaller development environments, a few people or even a single individual might handle the complete process. A supercomputer is a computer with a high level of performance compared to a general-purpose computer. The performance of a supercomputer is commonly measured in floating-point operations per second (FLOPS) instead of million instructions per second (MIPS). Since 2017, there are supercomputers which can perform up to nearly a hundred quadrillion FLOPS. Since November 2017, all of the world's fastest 500 supercomputers run Linux-based operating systems. Additional research is being conducted in China, the United States, the European Union, Taiwan and Japan to build even faster, more powerful and more technologically superior exascale supercomputers.Supercomputers play an important role in the field of computational science, and are used for a wide range of computationally intensive tasks in various fields, including quantum mechanics, weather forecasting, climate research, oil and gas exploration, molecular modeling (computing the structures and properties of chemical compounds, biological macromolecules, polymers, and crystals), and physical simulations (such as simulations of the early moments of the universe, airplane and spacecraft aerodynamics, the detonation of nuclear weapons, and nuclear fusion). Throughout their history, they have been essential in the field of cryptanalysis.Supercomputers were introduced in the 1960s, and for several decades the fastest were made by Seymour Cray at Control Data Corporation (CDC), Cray Research and subsequent companies bearing his name or monogram. The first such machines were highly tuned conventional designs that ran faster than their more general-purpose contemporaries. Through the 1960s, they began to add increasing amounts of parallelism with one to four processors being typical. From the 1970s, vector processors operating on large arrays of data came to dominate. A notable example is the highly successful Cray-1 of 1976. Vector computers remained the dominant design into the 1990s. From then until today, massively parallel supercomputers with tens of thousands of off-the-shelf processors became the norm.The US has long been the leader in the supercomputer field, first through Cray's almost uninterrupted dominance of the field, and later through a variety of technology companies. Japan made major strides in the field in the 1980s and 90s, but since then China has become increasingly active in the field. As of November 2018, the fastest supercomputer on the TOP500 supercomputer list is the Summit, in the United States, with a LINPACK benchmark score of 143.5 PFLOPS, followed by, Sierra, by around 48.860 PFLOPS. The US has five of the top 10 and China has two. In June 2018, all supercomputers on the list combined have broken the 1 exabyte mark. In computing, a Trojan horse, or Trojan, is any malicious computer program which misleads users of its true intent. The term is derived from the Ancient Greek story of the deceptive wooden horse that led to the fall of the city of Troy.Trojans are generally spread by some form of social engineering, for example where a user is duped into executing an e-mail attachment disguised to appear not suspicious, (e.g., a routine form to be filled in), or by clicking on some fake advertisement on social media or anywhere else. Although their payload can be anything, many modern forms act as a backdoor, contacting a controller which can then have unauthorized access to the affected computer. Trojans may allow an attacker to access users' personal information such as banking information, passwords, or personal identity. It can infect other devices connected to the network. Ransomware attacks are often carried out using a Trojan. A user is a person who utilizes a computer or network service. Users of computer systems and software products generally lack the technical expertise required to fully understand how they work. Power users use advanced features of programs, though they are not necessarily capable of computer programming and system administration.A user often has a user account and is identified to the system by a username (or user name). Other terms for username include login name, screenname (or screen name), account name, nickname (or nick) and handle, which is derived from the identical Citizen's Band radio term.